The IMDb summary of Robin Comisar’s latest short film reads simply: “A woman gets stuck in a Red Lobster commercial.” At the the recent Toronto International Film Festival screening of the short, aired prior to the world premiere of Brian Taylor’s Mom and Dad, Comisar commented that Red Lobster is not too happy about his film. Intriguing enough. What is Great Choice all about? Well, to speak a word is to divulge a spoiler, so I will be brief. 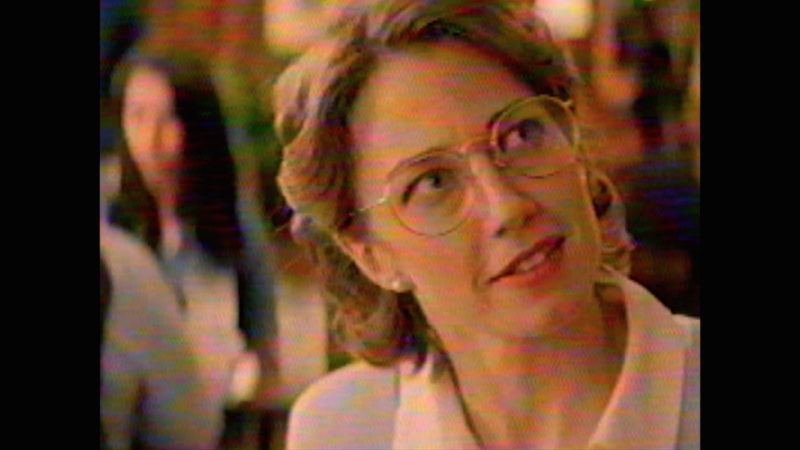 Comisar’s seven minute film is a VHS-homage commercial about a shrimp deal at Red Lobster. Then, it is a commercial about a shrimp deal at Red Lobster. Then, it is a commercial about a shrimp deal at Red Lobster. Comisar takes the Groundhog Day formula and spins it into the surreal. There is something eerie about the VHS quality of the commercial and the forced-down-your-throat customer service cheeriness of the commercial performances. Of course, Comisar uses this to his advantage, going to the extreme with both elements. Comisar, who has a short history with editing and visual effects, uses these skills to complicate this over-the-top commercial. In key moments, the effect of the video rewinding foreshadows moments to come. In other, more obvious moments, the VHS framing cuts out completely, giving way to crisp digital video. These visual flourishes are interesting, and Comisar approaches something spectacular with his looping of the footage, with the increasing alterations becoming more and more humorous and unsettling. However, there is a point in the short where the world of the commercial shifts drastically. The protagonist moves away from the main loop, and this is where the short begins to break down. It is an intriguing turn that works, but the film could have used one more major moment of surreal media manipulation to wrap the narrative up in a satisfying way. Great Choice is reminiscent of Adult Swim late-night content. Infomercials episodes like Unedited Footage of a Bear are spiritually linked to Great Choice. But Comisar’s potential is beyond the realm of late-night cable (not that there is anything wrong with the Adult Swim lineup). Comisar has an eye for what makes old media antiquated to a creepy degree. He understands what minor shifts need to be implemented to ratchet up a short in rapid succession. In the case of Great Choice, it is merely lacking that final gutshot that keeps short films in the minds of their audiences. Regardless, it is a wonderful introduction of Comisar’s creative abilities to a broader audience. Where can I watch this ? ?